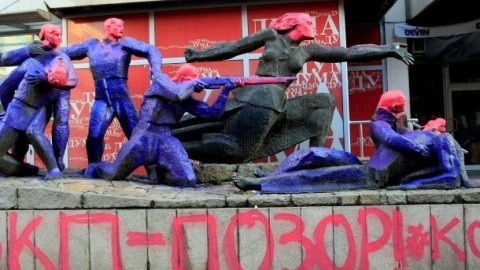 To sum up facts, six people were arrested in the small hours Thursday, on the 96th anniversary of the October Revolution - caught in the act of spraying with paint a WW II resistance monument in front of the headquarters of the Bulgarian Socialist Party. Among the perpetrators was influential blogger Asen Genov, who has been actively vocal in summer and fall anti-cabinet protests, as well as four members of minor yet important rightist party Democrats for Strong Bulgaria. The intervention drew the support of parts of the Bulgarian public, who saw it not only as a bold statement against the 1944-89 communist regime in Bulgaria (which has been officially declared criminal), but also as an act of protest against the current Socialist-backed cabinet. Critics, on the other hand, dismissed the painting of the monument as frivolous and disrespectful of those who fought and gave their lives in the struggle against Nazism and Fascism during the Second World War. Beyond the usual pros and contras, the action and the response to it can be adequately interpreted only in the light of lasting historical traumas and a recent polarization of Bulgarian political discourse. Besides painting the heads of statues pink and their torsoes purple (a nod to provocative Czech artist David Cerny), Genov & co. inscribed "BCP - Dishonor! Who?" on the monument's base. The two parts of this shorthand message can be read as conjuring up a ghastly mix of past and present in the EU's poorest member. While the exclamation voices the activists' outrage against the Bulgarian Communist Party, the question that follows - perhaps enigmatic to the outside viewer - is the lasting refrain of ongoing but dwindling anti-cabinet rallies. It asks about the identity of the person who nominated controversial media mogul Delyan Peevski for head of Bulgaria's State Agency for National Security, the brazen move that triggered the massive June and July protest marches. The logic seems simple - just as the Communist Party of old installed a criminal regime, so its heir, the Socialist Party, are staging the ruin of today's Bulgaria. This reasoning might be catchy. Yet many Bulgarians seem to have grown tired of being haunted by the specter of "communism," just as many grew weary of listening to that one-syllable question over the summer months. The overall message's reductionism poses a trio of perils: (1) it is not only simple but simplistic, (2) it bears no capacity to address the real and pressing issues crippling Bulgaria, (3) it stirs tension and hate, and stilts dialogue. This, by the way, is one of the reasons the strong summer protests tapered off, failing to reach any palpable goal other than the resignation of Peevski. Archaic early-90s chants such as "red trash" first lost the many left-leaning protesters, who were themselves just as outraged as the rest at the follies of the Socialist Party and the seemingly ubuquitous influence of oligarchy in Bulgaria. Then came the self-righteous attitude of some of the protesters' most vocal speakers and their chronic failure to mobilize new parts of Bulgarian society by addressing their worries and problems. But not only protesters are vulnerable to such criticism. Members of Bulgarian society seem to be becoming ever less able to reach out and talk to each other. Yet again, we are being reminded that Bulgaria has not come to terms with its history. But lasting political and economic problems only exacerbate the historical wounds. When reality cannot satisfy, one turns to fiction. But fiction sometimes works better if it creates an enemy in real life, someone to blame for one's misfortune. Democratic rightists have raised an outcry against a recent upsurge of anti-immigrant xenophobia in Bulgaria. But for May 12 general elections DSB ran in a coalition with a party who trace their heritage to a Nazi-like Union of National Legions back from the 1930s and '40s. Throughout this year, protesters - inculding students who recently occupied Sofia University - have cried out against the dishonesty and lack of real democracy in Bulgarian politics. But a look back at all the carnage that was a tragic companion to modern Bulgarian political life in the decades since its inception in 1878 should sober up all rash revolutionary heads. Bulgaria now needs dialogue and reconciliation, perhaps more than ever since 1989.